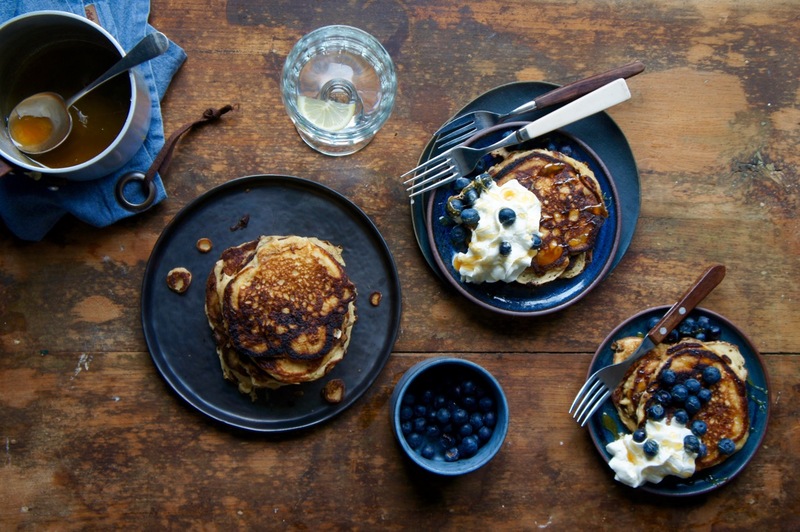 If you’re looking for something healthy, I don’t mean to disappoint you, but this is a pancake recipe. Yes I’m using spelt flour, but it’s still a pancake recipe. With butter. And if you so wish, whipped cream (which in Dutch is slagroom – great name). So I’ve just moved to Amsterdam and it’s wonderful. 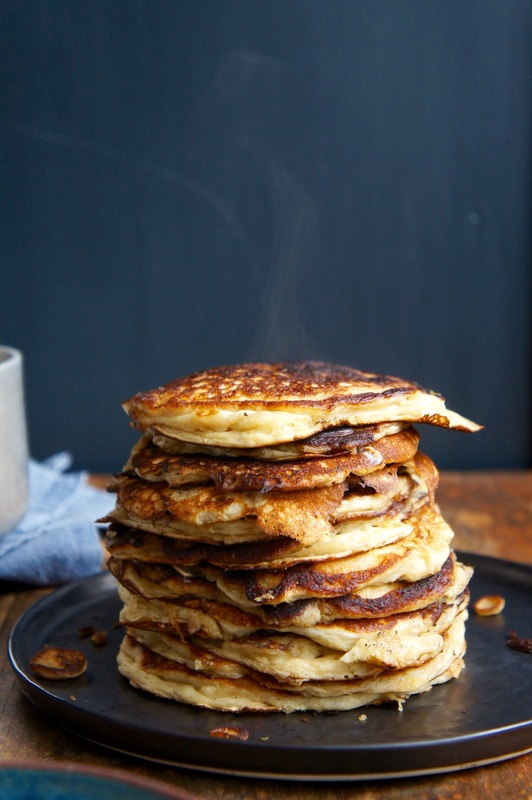 I can go on about the wonderful Dutch people and their many traditions, but today I’m going to focus on one – the windmill – because that is what resulted in me making these deliciously fluffy buttermilk spelt pancakes. Last week, I was lucky enough to take a trip to Molen de Valk, a working windmill that mills a range of beautiful flours from grain grown in the surrounding fields (as local as you can get – East London hipsters would love it). Inside the windmill, whilst the wind is fiercely blowing, you can feel the structure vibrating, smell the grain being milled, and even touch the lightly warm, freshly milled flour, straight from the giant mill stones. Much like the beautiful mill at Shipton Mill – I know, I’m a pretty big cheese when it comes to mill-tour experience – the interior is wooden, close knit and all covered in a very light sprinkling of flour. 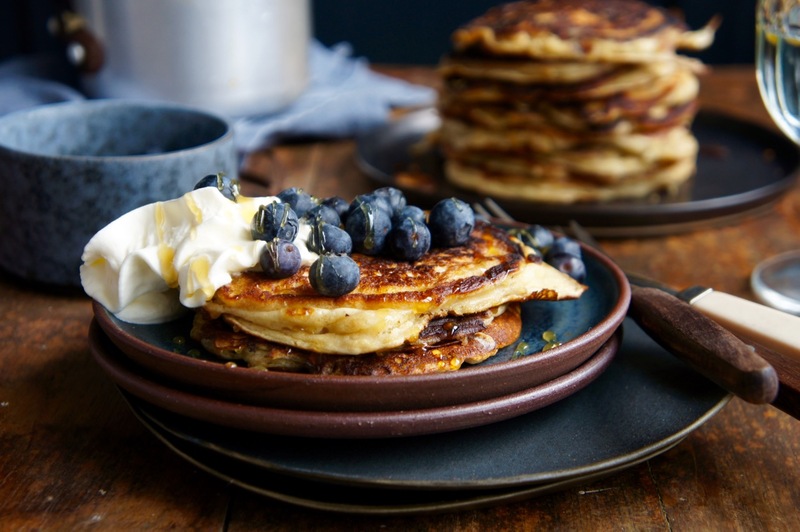 When we left the mill, I was happily loaded with several kilograms of fresh spelt flour, which, when combined with my current state of unemployment, led to some seriously amazing pancakes. As well as some relatively unsuccessful bread that you won’t be hearing more about. 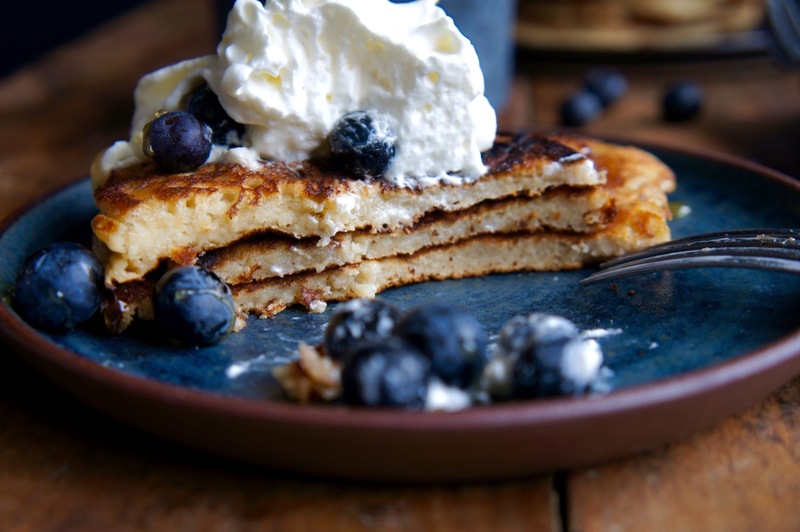 For these pancakes, I did some recipe research to get some tips, but ended up adjusting it to work with the slightly lower-gluten spelt flour and to make sure the pancakes had a high enough fluff-factor. If you don’t already use spelt, I would highly recommend you give it a go; it’s an ancient grain with a sweet and nutty flavour that is very high in nutrients and slightly lower in gluten than it’s sister, wheat. It’s really easy to digest and a lot of people find it a lot less bloatifying than wheat. That’s enough of the boring stuff – now make the pancakes. 1. Melt the butter in a small pan and leave it to cool. In a large mixing bowl, combine the spelt flour, sugar, bicarbonate of soda, baking powder and salt. 2. In a separate bowl or mixing jug, mix the buttermilk, milk, eggs and cooled melted butter. You want the buttermilk to be room temperature, and the melted butter to be cooled so the butter doesn’t cook the other ingredients and also doesn’t seize in the cold buttermilk. 3. Heat a large frying pan over a medium to high heat. At the last minute before making the pancakes, mix the dry and wet ingredients together. Make a well in the dry ingredients and pour in the buttermilk mixture. 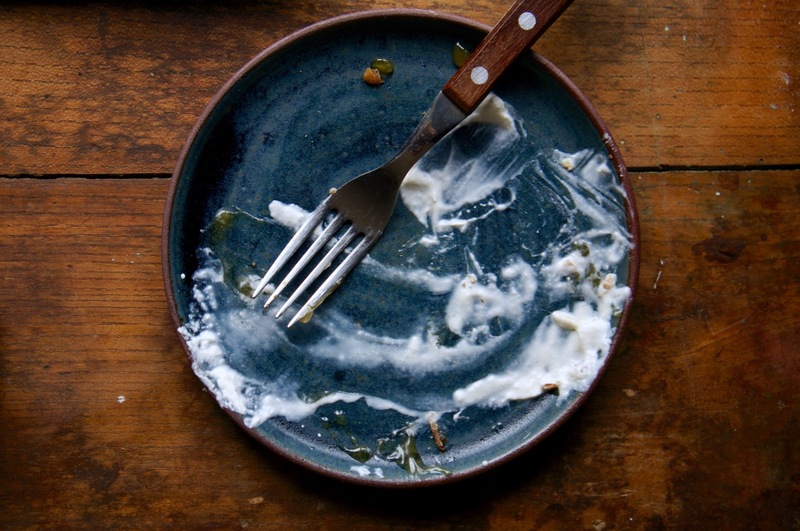 Use a fork to gently mix the ingredients together until only just combined, even if there are still lumps – do not over-mix or the pancakes won’t be as fluffy. 4. When your frying pan is hot*, add a small knob of butter to the pan and swirl it around until its melted. Dollop small ladles of the pancake mixture into the hot pan, two or three at a time so they don’t run into each other and you have space to flip them. 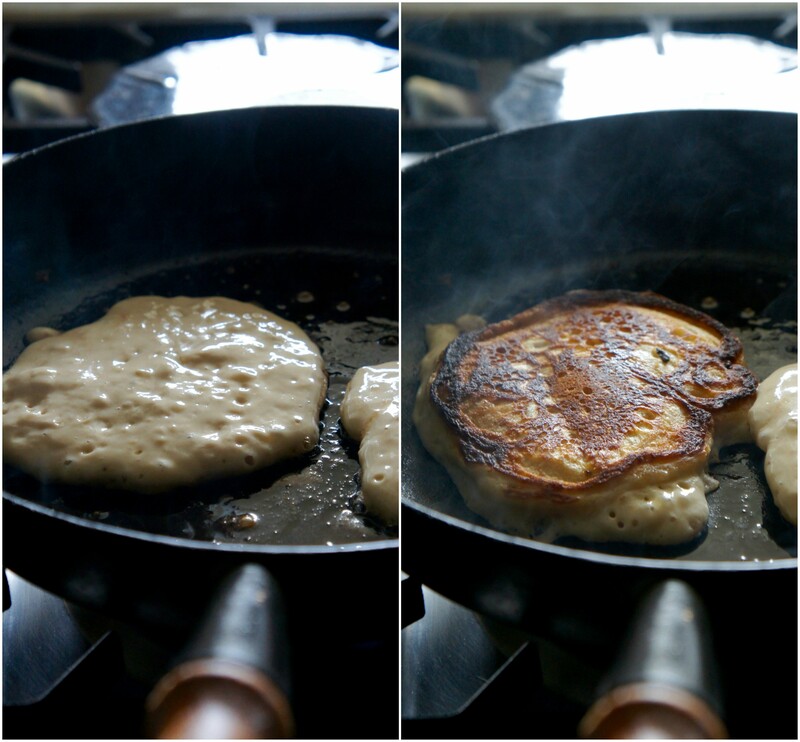 When the top of the pancake is bubbling and the bottom is golden brown, use a spatula to flip the pancake over. Fry for a minute or so until both sides are golden brown and the pancake is just cooked through. 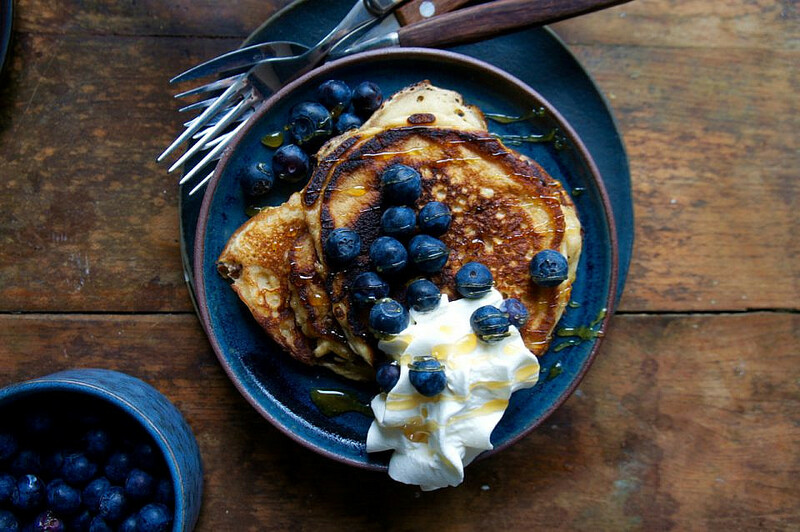 Add a new bit of butter for every few pancakes and continue until they are all ready. Stacking the pancakes helps keep them warm. 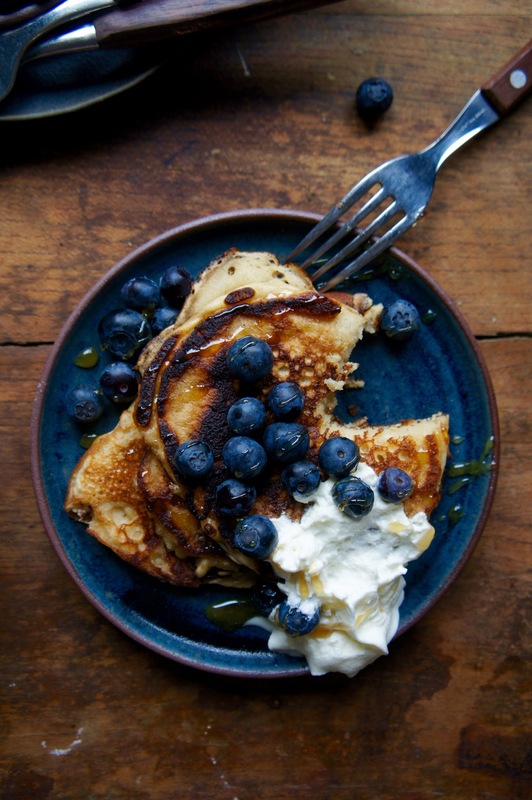 *Tip – The frying pan needs to be really hot to stop the pancake batter from spreading too much when it’s in the pan. 5. 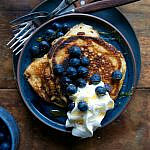 Serve with whipped cream or thick, creamy yoghurt and blueberries. Delish!